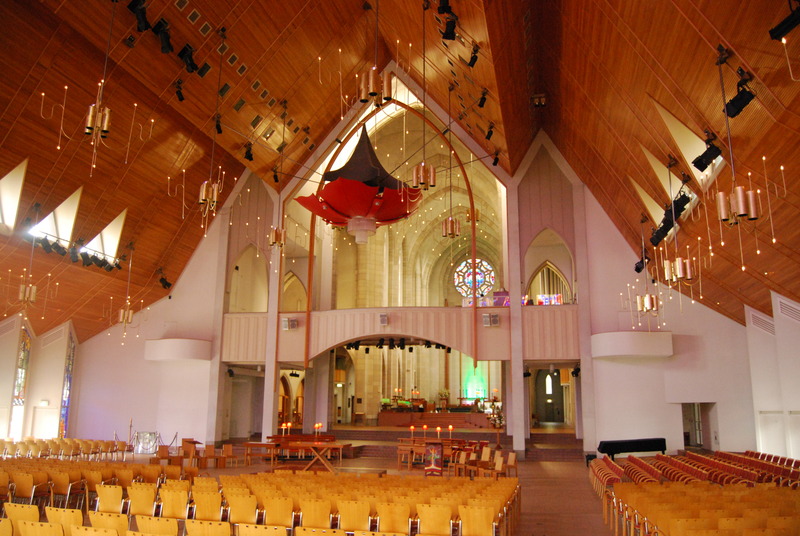 It would be good to think that Christ Church Cathedral, Nelson, on New Zealand’s South Island, was a work in progress. Its frankly odd appearance is a result of its history: it reached its current shape and style through earthquake, fire and not a little controversy. In 1842, within a year of the establishment of what became the town of Nelson, Bishop George Selwyn arrived with a tent which he planted at the top of what is now called Church Hill. He returned in 1851 to dedicate the replacement wooden church as Christ Church [see http://find.natlib.govt.nz/primo_library/libweb/action/dlDisplay.do?vid=TF&docId=nlnz_tapuhi670250]. This structure was enlarged and altered in 1859, 1866 and again when it was inaugurated as a cathedral in 1887. The spire was damaged by an earthquake in 1893 and the tower demolished as unsafe in 1921, shortly before the building was further damaged by fire. Peck’s design would have looked magnificent [http://photonews.org.nz/nelson/issue/NPN76_19670304/fig-NPN76_19670304_053b.html], but hardly had work begun than the Murchison earthquake of 1929 led to tighter building regulations, and construction came to a halt in 1932. The result was that Peck’s nave stopped abruptly at clerestory level: a temporary roof was installed, and the previous wooden chancel attached to the east end. A simplified design of 1954 by Ron Muston brought a sense of closure and practicality to the interrupted design. Muston used reinforced concrete, faced with ground marble, to complement Peck’s marble blocks. The dominant feature is the tower, a tall, spare essay in lightweight Gothic, much more adventurous than Peck’s orthodox Gothic Revival design. The cathedral was completed in 1967 and consecrated, once it became clear of debt, in 1972. Of course, it doesn’t look complete. Peck’s cathedral proved to be unbuildable on its tectonically vulnerable site. But perhaps one day it might be possible at least to complete the nave. Some medieval cathedrals stood incomplete for centuries: Cologne, paused in 1473, was finished in 1880; Bristol, interrupted at the Reformation, was eventually completed in 1888; the first stone of Milan Cathedral was laid in 1386 and construction ended in 1965. For details of Mike Higginbottom’s lecture Antipodean Gothic: English architecture “down under”, please click here. This entry was posted in Exploring New Zealand, Gothic Down Under: English architecture in the Antipodes, Sacred Places on January 9, 2014 by Mike Higginbottom. One of the finest ferry journeys in the world is the 70-kilometre Interislander voyage across the 24-kilometre wide New Zealand’s Cook Strait, between the south of the North Island and the north of the South Island. 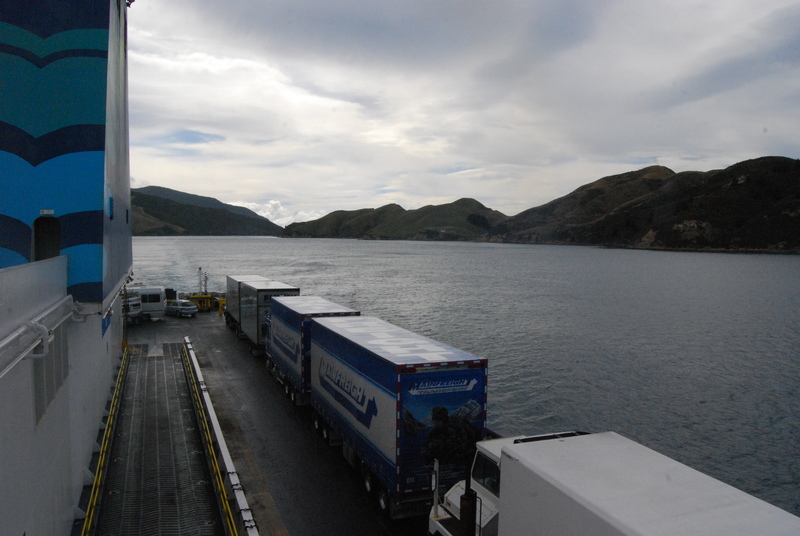 The three-hour trip takes so long because it involves sailing in or out of Wellington Harbour and penetrating the drowned valleys of the Marlborough Sounds. There’s a detailed history of the Cook Strait ferries at http://www.nzhistory.net.nz/culture/cook-strait-ferries. It’s a fine, relaxing journey – as long as you’re a passenger, and not responsible for steering the ship. The Cook Strait is notoriously rough and unpredictable, with particularly weird tidal surges: http://www.niwa.co.nz/sites/default/files/images/imported/0011/43004/cookmov_2.gif. The vessel, MV Kaitaki, felt oddly familiar. It turned out to be a former Irish Ferry, originally built in 1995 for the Holyhead-Dublin route: originally the MV Isle of Innisfree, it was latterly P&O’s MV Challenger, operating between Portsmouth and Bilbao. ‘Kaitaki’ is the Maori word for ‘challenger’. The other two vessels on the Interislander service, DEVs Arahura and Aratere, are rail-capable, purpose-built as the physical link between the railway systems on the two islands. Though none of the ferries transport passenger rail vehicles, they make it possible to travel all the way from Auckland to Christchurch by surface public transport, using the Overlander, the Interislander ferry and the Coastal Pacific train [see http://www.seat61.com/NewZealand.htm]. Indeed, when I return to New Zealand at leisure I plan to use that route and then the TranzAlpine to reach the west coast of the South Island at Greymouth. The errand that took me on the Interislander was a lecture for the Nelson Decorative & Fine Arts Society at the Suter Art Gallery [http://thesuter.org.nz/visitus.aspx]. While I was in Nelson my host, Ainslie Riddoch, and her colleagues gave me snapper for lunch at the Boat Shed Café [http://www.boatshedcafe.co.nz] and dinner at Harry’s Bar [http://www.harrysnelson.co.nz], where we admired the waiter’s sang froid in serving a ménage à trois in the far corner. Ménage à trois is not, I’m assured, usually on the menu. Ainslie’s husband, Hamish, told me about the holiday potential of the “Top of the South”, in particular, the tiny settlement of Collingwood, named – like Nelson and Wellington – after a British hero of the French wars a generation earlier. During the 1850s gold rush there was a serious suggestion that Collingwood should be designated the capital of New Zealand. Now it’s where tourists go to experience wide-open spaces, with curious outliers of history such as the Collingwood Cemetery (1857) and St Cuthbert’s Church (1873): http://www.farewellspit.com/collingwood-new-zealand.html. I’m fascinated by remote places that time passed by, so I will return to the Top of the South. This entry was posted in Exploring New Zealand, Life-enhancing experiences, Transports of Delight on January 9, 2014 by Mike Higginbottom. 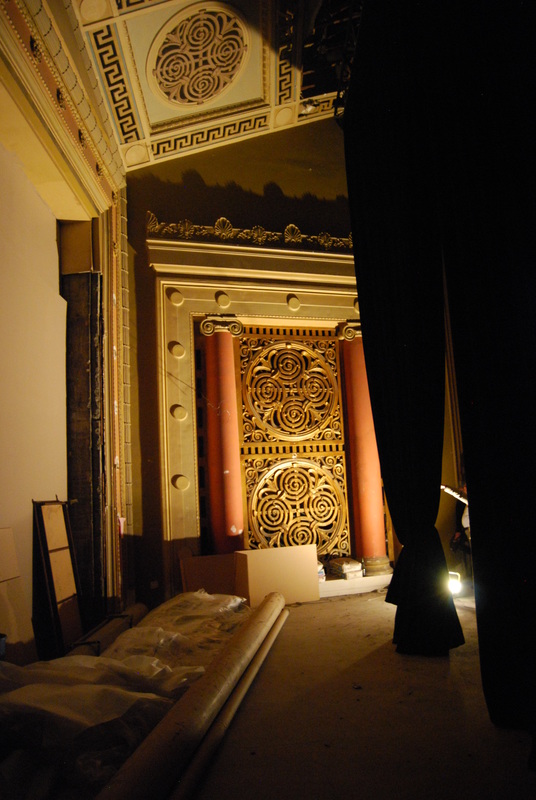 When I visited the Wellington Decorative & Fine Arts Society to present my Fun Palaces lecture in February 2011 my host, David Carson-Parker, showed me the Embassy Theatre, a restoration-project in which he had been involved. The Embassy was originally and appropriately called the “De Luxe”. It was designed by the New Zealand architect Llewellyn E Williams (1884-1967) for the theatre entrepreneur William Robert Kemball (1881-1969), and opened on October 31st 1924. It was and is a notably distinguished building on a corner site facing Courtenay Place, four storeys high with an impressive classical frontage. The grand tiled foyer and staircase remains: originally the auditorium consisted of stalls and a generous balcony. The stage was suitable for live performances and there was an orchestra pit, which was later used to house the console of a Wurlitzer organ and is now the second screen, the aptly-named Cinema Deluxe. The De Luxe passed to another New Zealand cinema magnate, Robert Kerridge, who renamed it the Embassy. In 1960 it was equipped with a wide screen for 70mm projection, and in the 1970s the auditorium was converted to a single rake by building out from the balcony front, so that the stalls space could be used for other purposes. A 1991 project to convert it as a home for the Royal New Zealand Ballet came to nothing, and there was a risk that the Embassy would be lost. To resist this possibility the Embassy Theatre Trust was formed in 1995. In conjunction with the Wellington City Council, the Trust bought the building in 1997 and restored it to greater glory. It re-opened in time to host the world premiere of Peter Jackson’s The Return of the King (2003), the final part of his Lord of the Rings trilogy. As such, it now holds a place in the history of New Zealand film, and well as New Zealand cinema. When David showed me round on a quiet summer Sunday morning, my first reaction was – what a splendid place to have coffee and read the Sunday papers. You can eat and drink at Blondini’s Café & Bar, and indeed take your refreshments into the auditorium, which consists of the original balcony and a few additional rows beyond the balcony front. The refurbished auditorium has all the comforts and amenity that contemporary filmgoers expect. 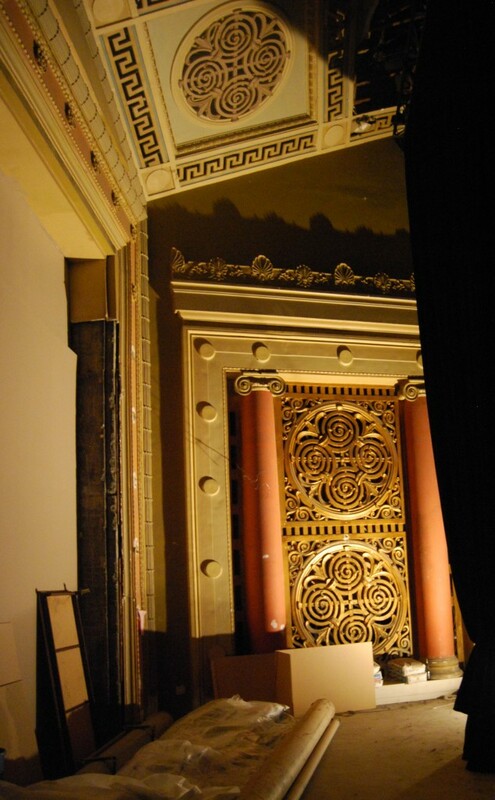 Behind the modern screen, however, the original proscenium and ante-proscenium remain in faded pale blue, grey, pink and gold. David tells me there’s a scheme to make this original decoration visible from the auditorium. When we showed images of it to the Wellington DFAS audience, people were astonished to discover that it still existed, and delighted to find that there’s more to the Embassy than meets the eye. There is a detailed description of the Embassy Theatre at http://www.historic.org.nz/TheRegister/RegisterSearch/RegisterResults.aspx?RID=7500&m=advanced. If you need to know what’s on at the moment, the website is at http://www.eventcinemas.co.nz/cinemas/the-embassy.aspx. This entry was posted in Exploring New Zealand, Fun Palaces on January 8, 2014 by Mike Higginbottom. Wellington, the largest city in New Zealand’s North Island, came close to losing its most attractive and comfortable theatres in the 1970s and 1980s. Now the Opera House, the St James and the Embassy provide a thriving cultural repertoire which enriches the city centre. The city is currently marketed as the “capital of cool”, but it might easily have been left out in the cultural cold. I was given privileged access to the St James Theatre, known in the entertainment industry as “Jimmy’s”, thanks to the manager, Bob Foot, and my Wellington host, David Carson-Parker. Its initial claim to fame is that it was the first steel-framed, reinforced concrete theatre in the world when it was constructed in 1912 to the designs of Henry Eli White (1876-1952), a prolific New Zealand theatre architect, for the impresario John Fuller, who had operated an earlier theatre on the site. 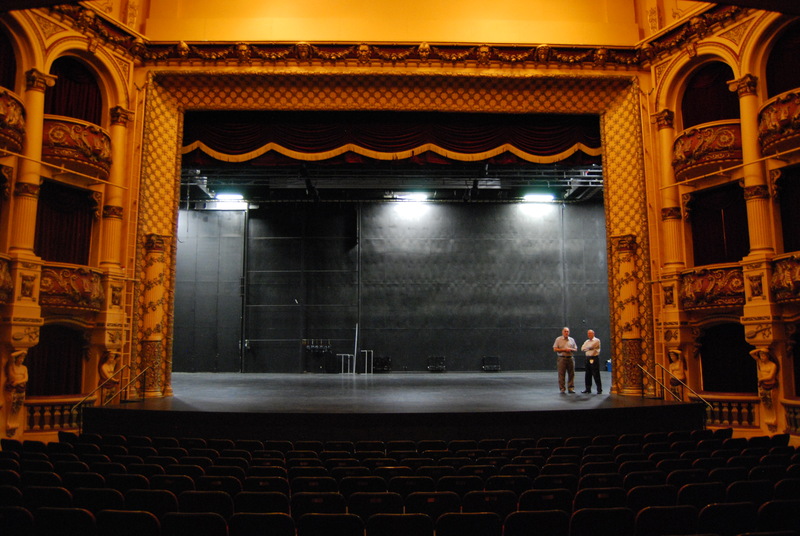 The St James Theatre closed in 1987 and became the focus of a furious conservation row between a developer, the Chase Corporation, and local campaigners, with Wellington City Council in the midst. Eventually in 1993 the city council bought it and restored it as a venue for the New Zealand International Arts Festival and a home for the Royal New Zealand Ballet, extending into the adjacent property to provide a café and bar, “The Jimmy”. If Wikipedia is to be believed [http://en.wikipedia.org/wiki/St._James_Theatre,_Wellington] the St James hosts a wonderful company of ghosts – a Russian performer called Yuri, a wailing woman and wheezing Stan Andrews. None of these were in evidence when Bob, David and I toured the building from top to bottom on a sunny summer morning. They couldn’t show me the auditorium of the rival theatre across the road, the Opera House (William Pitt, 1911), because a lighting rehearsal was in progress, so I have to return when I’m next passing by. The St James Theatre and the Opera House, long-time rivals, are now under co-ordinated management, operated by Positively Wellington Venues: http://pwv.co.nz/our-venues/st-james-theatre. To see what’s on, go to http://www.stjames.co.nz. The city of Wellington stands on shaky ground, lying across a major geological fault in an area of constant seismic activity. When I visited Wellington in February 2011, local people were particularly concerned at the tribulations in Christchurch, a city which had been considered much less vulnerable than their own. Within a very few years of its first settlement in 1840, two major earthquakes occurred in 1848 and 1855, and as a result all Wellington’s early buildings were built in timber, including what are now called the Old Government Buildings (1875-6), the second-largest wooden building in the world, and the pro-cathedral, Old St Paul’s (1866). The Anglican diocese of Wellington was about to start the replacement for Old St Paul’s when the Second World War intervened. Influenced by the effect of the 1931 earthquake in Napier, North Island, the architect Cecil Walter Wood (1878–1947) decided against building a medieval-Gothic building in ferro-concrete and instead used reinforced concrete to create a design that uses Gothic forms, modernised under the influence of Ragnar Östberg’s Stockholm City Hall (1911-23) and the Art Deco movement, and looking towards Sir Edwin Maufe’s Guildford Cathedral (1936-61): http://www.teara.govt.nz/en/biographies/4w25/1/2. Cecil Wood never saw even the beginning of his St Paul’s Cathedral. Queen Elizabeth II laid the foundation stone in 1954, and the first phase was opened ten years later. The bulk of the nave was added in the second phase, 1970-2. A historic Lady Chapel, formerly the 1905 timber St Paul’s Church, Paraparaumu, North Island, was added in 1991, and the westernmost bays of the nave, the narthex and the bell-tower were finished in 1998. Though it was criticised from the start, and modified after his death, Cecil Wood’s design has retained its integrity. I found it attractive – an architectural essay at the furthest edge of anything you could call Gothic – with a traditional layout, high round arches, subtle use of natural light and quirky arcades that reminded me of details from J R Leathart & W F Granger’s late 1920s cinemas, of which the Odeon, Richmond-on-Thames (1929) survives. The Catholic Cathedral in Wellington is the opposite of Gothic: the Sacred Heart Cathedral is an uncompromisingly Italianate basilica of 1901, replacing the Gothic St Mary’s, built in 1851 and destroyed by fire in 1898: http://www.shcathedral.wellington.net.nz/history/index.htm. However, Wellington has a rare example of modern Gothic, the Catholic Church of St Mary & the Angels, built 1919-22 in ferro-concrete by Frederick de Jersey Clere. It’s a world away from Cecil Wood’s cathedral, yet hides its modern construction within traditional architectural forms: http://www.historic.org.nz/TheRegister/RegisterSearch/RegisterResults.aspx?RID=36&m=advanced. This entry was posted in Exploring New Zealand, Gothic Down Under: English architecture in the Antipodes, Sacred Places on January 6, 2014 by Mike Higginbottom. 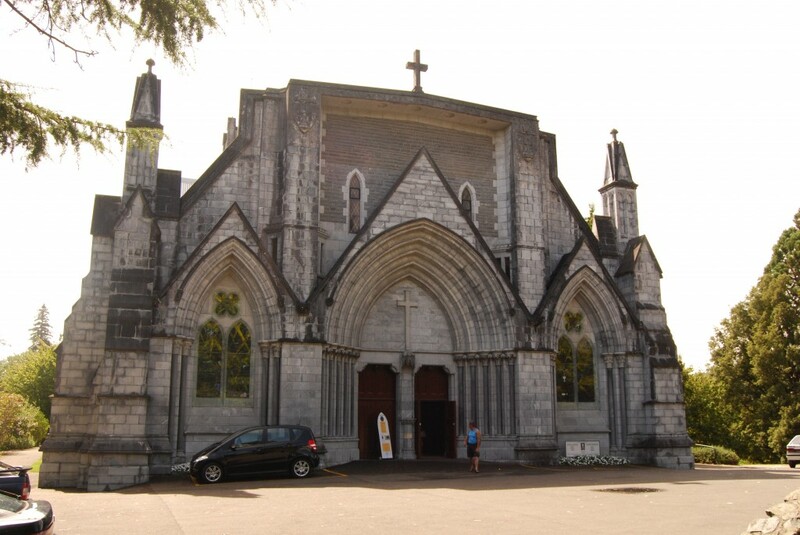 I explained in Gothic New Zealand: Auckland 2 that the first and only Bishop of New Zealand, George Augustus Selwyn (1809-1878), brought to the antipodes the Ecclesiological idea that a church must have pointed arches and all the architectural paraphernalia of the Middle Ages. He was an Anglican cleric operating in a context where, until a few years before he reached New Zealand in 1841, Australia had been an archdeaconry in the diocese of Calcutta. By the time he returned to England for the last time in 1868, New Zealand had seven Anglican bishoprics. A visible part of Selwyn’s legacy is the New Zealand tradition of building timber churches that have the shapes of masonry construction. The first Anglican cathedral in Wellington, now known as Old St Paul’s, was designed by an architect-turned-clergyman, Rev Frederick Thatcher (1814-1890), who was closely associated with Bishop Selwyn. 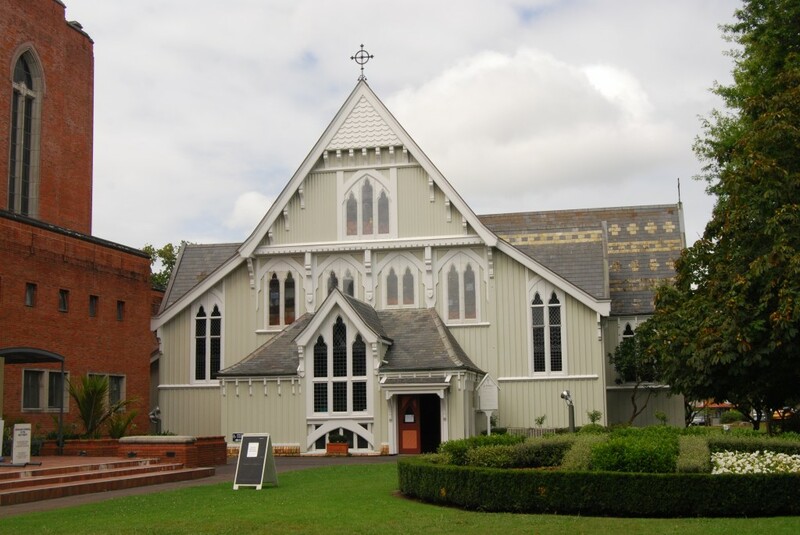 It was the pro-cathedral for the Diocese of Wellington from 1866, when it was built, until 1964, when the bishop’s throne, the cathedra, moved to the new St Paul’s Cathedral. To save it from demolition the New Zealand Government took on Old St Paul’s as a historic site, and it remains consecrated. Like other “Selwyn” churches, it is a warm and welcoming place, the darkness of its walls contrasting with the brilliance of its stained glass windows. I didn’t have the opportunity to join a service in my short stay, but I sat at dinner with a lady who told me she always visits St Paul’s at Christmas, and at other times, because singing hymns and carols there is “like singing inside a violin”. For further details, see http://www.historicplaces.org.nz/placestovisit/lowernorthisland/oldstpauls.aspx. The city of Auckland has a special place in the history of the Anglican Church in New Zealand, because it was the base from which Bishop George Augustus Selwyn (1809-1878) set up missions across the two islands as the first and only Bishop of New Zealand between 1841 and 1858. Selwyn, who rowed in the first ever Oxford-Cambridge boat race and after whom Selwyn College is named, was a fellow of St John’s College when the Cambridge Camden Society, later known as the Ecclesiological Society, began to promote the idea that a truly Christian building should be built in the Gothic manner. 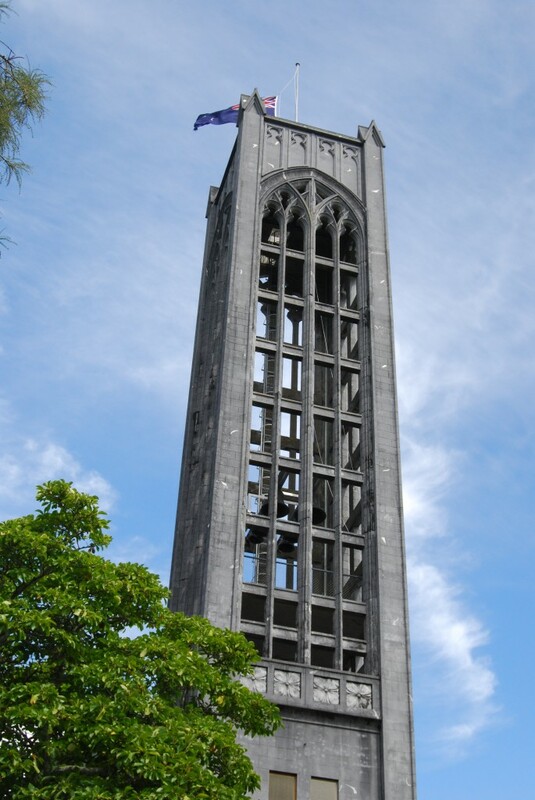 As Bishop of New Zealand he had to face the fact that masonry architecture was out of reach: the cost and time involved in building in stone meant that the first New Zealand churches had to be timber. 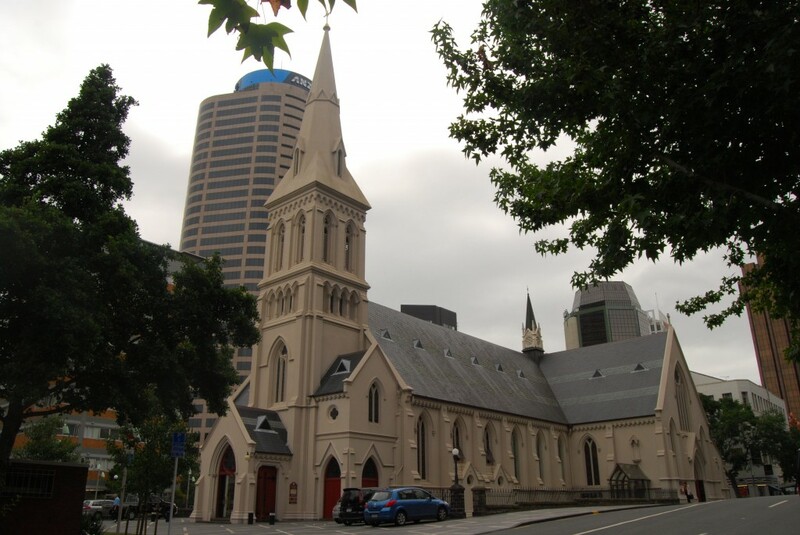 But they could still be Gothic, and the Anglican community in Auckland outgrew a succession of churches until what is now called Old St Mary’s was begun in 1886 to the ambitious designs of Benjamin Mountfort (1825-1898). Mountfort was a prolific first-generation New Zealand architect, and at St Mary’s he provided all the detail that would be found in a much larger stone-built European cathedral, with a three-sided sanctuary and lancet windows under a generous cat-slide roof. 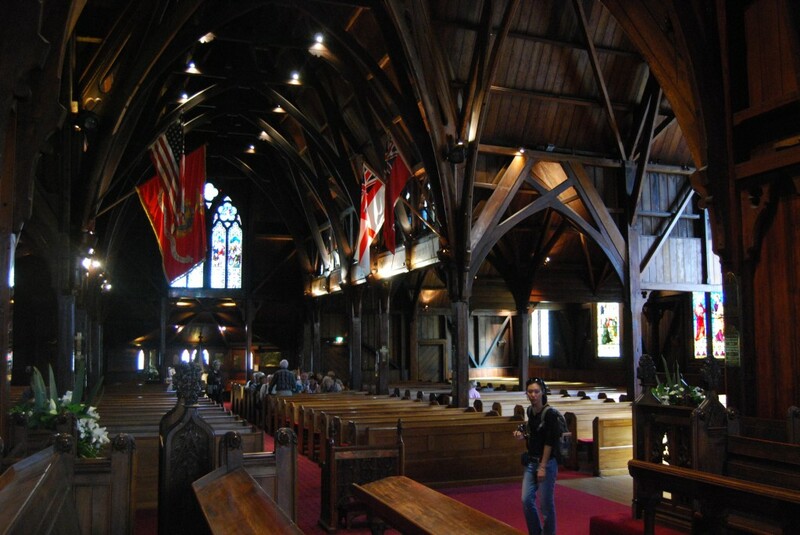 The largest timber church in the world, it was designated as Auckland’s Anglican Cathedral in 1887 and was completed in 1898. Its much larger successor, Holy Trinity Cathedral, was begun in 1959 to a reduced version of a twenty-year-old design by Charles Towle that had been stalled by the start of the Second World War. The choir, transepts and crossing – reminiscent of Sir Edward Maufe’s contemporary Guildford Cathedral in Surrey – were completed in 1973. 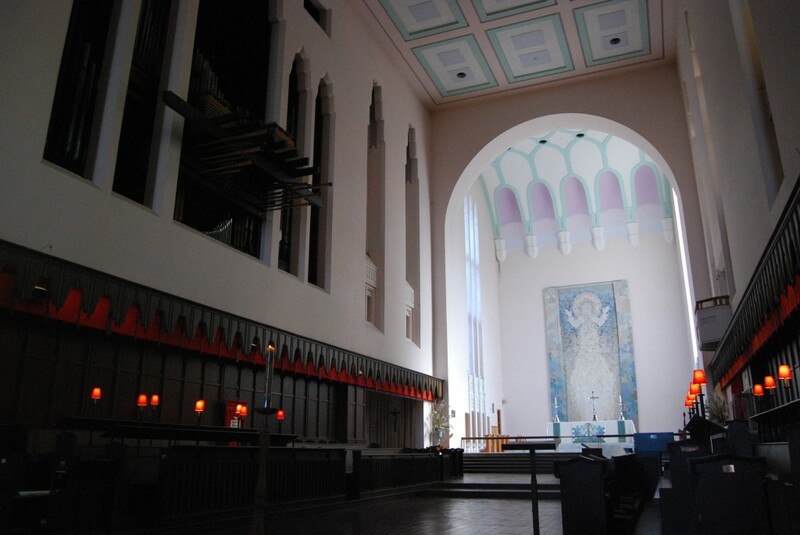 The nave, to a much lighter design with a glazed west wall by Richard Toy, was added in 1991-5. Now a further chapel, to the liturgical east (geographical south) is under way, due to be completed by Christmas 2014, the bicentenary of the arrival of Christianity on the North Island: http://www.anglicancommunion.org/acns/digest/index.cfm/2012/5/8/Dramatic-chapel-for-Holy-Trinity. The conjunction between the two is vibrant: it’s a very special interior space. Next door, Old St Mary’s stands – a very different, antique interior – on a new site. It was transported bodily across the road and turned ninety degrees in 1982. Update: Stewart Buckthorp has added a very useful and detailed comment to this article. This entry was posted in Exploring New Zealand, Gothic Down Under: English architecture in the Antipodes, Sacred Places, Victorian Architecture on January 5, 2014 by Mike Higginbottom. It’s all too easy to forget how much history is packed into the nineteenth-century outposts of the British empire. A country like New Zealand grew to maturity within two or three generations, who brought their baggage with them and established a home-from-home in a land that belonged to others. When I visited Auckland to lecture to the Auckland Decorative & Fine Arts Society, I wanted to see as many nineteenth-century churches as possible for a lecture I’m researching on Antipodean Gothic architecture. My host Anne Gambrill propelled me in record time to a succession of unexpected treasures. 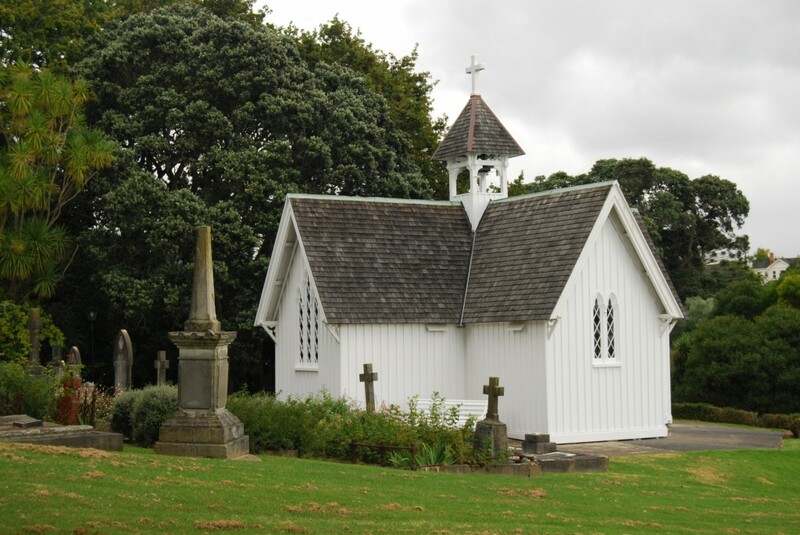 She took me to the tiny cruciform St Stephen’s Chapel at Judges Bay, no bigger than a modest bungalow, where the original Constitution of the Church of the Province of New Zealand was signed in 1857 – a location I’d probably not have found unassisted. She also alerted me to St Matthew’s Church in the city-centre, unmistakably a design by the British architect John Loughborough Pearson, who was responsible for Truro Cathedral in England and St John’s Cathedral, Brisbane. In fact, the design was completed after his death in 1898 by his son Frank Loughborough Pearson. This tall, chaste, cruciform, stone-vaulted building was completed in 1905, though without the intended spire. As St Matthew-in-the-City, the parish has a proud record of social activism: http://www.stmatthews.org.nz. 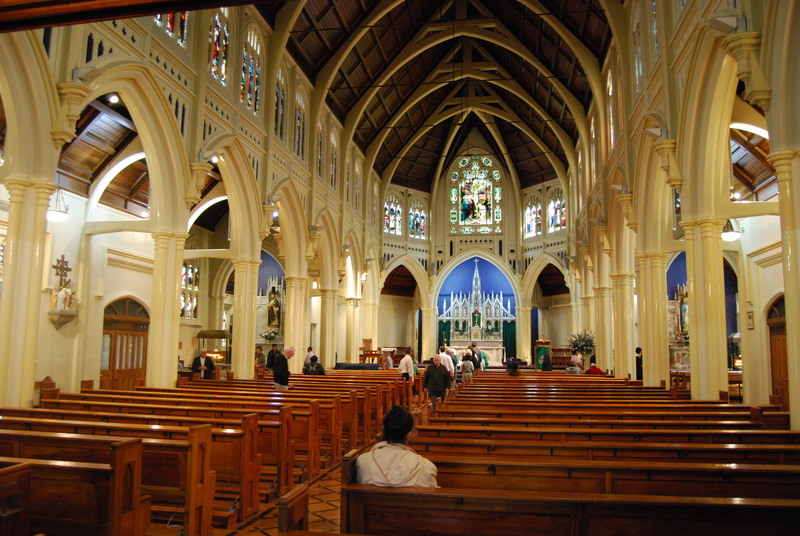 The mother church of the Catholic diocese of Auckland is the ornate St Patrick’s Cathedral, designed by the Auckland father-and-son practice of Edward (1824/5-1895) and Thomas Mahoney (1855-1923) and completed in 1908. The third church on the site, St Patrick’s is revered as the base of the original Catholic mission on North Island, led by Bishop Jean Baptiste Pompallier (1801-1871). The nineteenth-century development of New Zealand churches – alike in the sense of congregations and buildings – was extremely fast. An entire heritage of individual endeavour and architectural heritage evolved within the first three generations of Europeans to settle. And each of those church-building generations, Catholic and Anglican alike, looked back to the home country for the styles and imagery of their places of worship. When I visited the Auckland Decorative & Fine Arts Society to give a lecture, my hostess Anne Gambrill picked me up at the airport and swept me off for lunch to the Pah Homestead, which is – as the old V&A advert might have said – a very fine café with an art gallery attached [http://www.pahcafe.co.nz/index.cfm]. 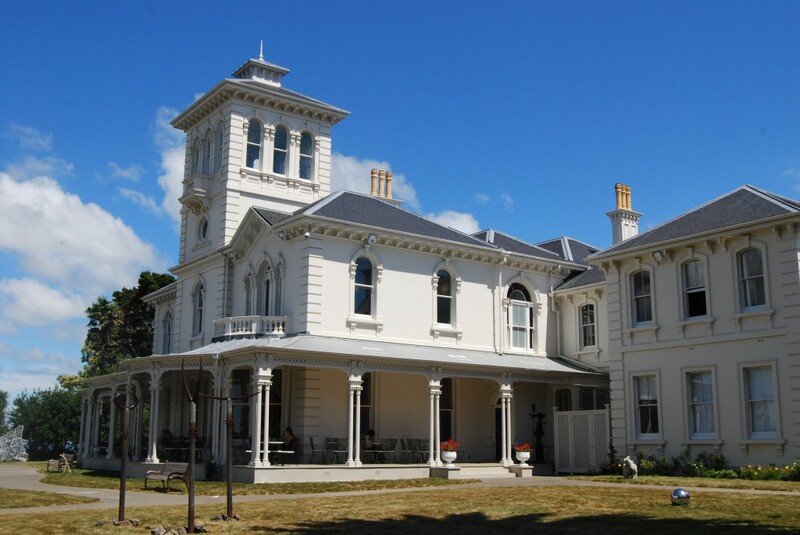 The homestead was built for a businessman, James Williamson, in 1877-9, to designs by the father-and-son team Edward (c1824-1895) and Thomas (1855–1923) Mahoney, who also built St Patrick’s Roman Catholic Cathedral, Auckland. It ceased to be a home as early as 1888, after Williamson’s death, and has been successively used by the Anglican and Roman Catholic Churches. Fortunately, although not a stick of furniture remains, the building itself is remarkably intact and rich in plasterwork, joinery, parquet flooring and marble fireplaces. Auckland City Council purchased it in 2002 to develop it and the surrounding park as an amenity. As the TSB Bank Wallace Arts Centre, the Pah Homestead opened to the public in August 2010. It is now the home of the James Wallace Art Trust, which collects and displays contemporary New Zealand art. Sir James Wallace, who has been collecting since the early 1960s, admitted, “I learned enough trying to paint to know that I was no good at it.” Instead, he invested massively in young artists: the result is a “diary collection”, from which nothing has been sold. There is an entertaining attempt to interview Sir James at http://www.nzherald.co.nz/arts/news/article.cfm?c_id=544&objectid=10746252. Of all that was on offer when I visited the Pah, I most enjoyed Matthew 12/12 by Gregor Kregar (b 1972) – seventy-two ceramic sheep, all in woolly jumpers, crowded into one corner of the room by a ceramic sheepdog: http://www.gregorkregar.com/Gallery/O5.html. You could say it’s a fresh interpretation of New Zealand lamb. In addition to live sheep [http://www.gregorkregar.com/Gallery/O2.html, http://www.gregorkregar.com/Gallery/O3.html and http://www.gregorkregar.com/Gallery/O4.html] Gregor Kregar, who is based in Auckland, also does ceramic pigs [http://www.gregorkregar.com/Gallery/O7.html] and mongrels [http://www.gregorkregar.com/Gallery/O6.html]. Perhaps live pigs and mongrels are less biddable than sheep. You can take a virtual tour of the current exhibition at the Pah Homestead at http://wallaceartstrust.org.nz/wallace-art-awards/virtual-gallery. Indeed, you can change the colour of the walls if you like. This entry was posted in Exploring New Zealand, Life-enhancing experiences, Victorian Architecture on January 2, 2014 by Mike Higginbottom. When I did a lecture-tour for the New Zealand Decorative & Fine Arts Societies [http://www.nadfas.org.uk/default.asp?section=209&page=1179] their travel co-ordinator Jenny offered me the option of travelling from Hamilton to Wellington (that is, much of the length of the North Island) by air or by rail. For me that’s a no-brainer. There’s no finer way to see a land than through the window of a railway carriage. Until 2012 [see below] the Overlander took twelve hours for the full journey from Auckland to Wellington, 9½ hours from Hamilton southwards. It’s a comfortable, leisurely trip, at the time using rolling stock very similar to the TranzAlpine. Mark Smith, the Man in Seat 61, points out that this is the journey that inspired the film producer Peter Jackson, who first read J R R Tolkein’s Lord of the Rings on a train on the North Island Main Trunk Railway and returned to the region to shoot his film trilogy Lord of the Rings (2001-3). The journey is an unmissable opportunity to sense the scale of the North Island. The line climbs into the volcanic centre of the island, and then drops into the precipitous Rangitikei gorge. Towards evening it finds its way to the west coast, where on fine summer evenings there’s a grandstand view of the sunset. Driving a railway through the heart of the island took nearly a quarter of a century: construction started in 1885 and the last spike was driven in 1908. The engineering is spectacular. The most memorable feature of all is the Raurimu Spiral, which lifts the line 132 metres within a distance of two kilometres, by twists and a spiral over 6.8 kilometres of track. It’s one of those stretches of railway where the train nearly meets itself coming back: http://en.wikipedia.org/wiki/Raurimu_Spiral. Some of the viaducts on the final 1908 section are as impressive as those on the TranzAlpine line. The Makatote Viaduct [http://trains.wellington.net.nz/misc2/makatote_1983.jpg] is an original steel structure, 258 feet above the river-bed; the curved Hapuawhenua Viaduct is a modern concrete replacement, 167 feet high, built on a diversion from which the earlier steel viaduct is visible to the east of the line – http://www.ohakunecoachroad.co.nz/pages/hapuawhenua-viaduct.html and http://maps.google.com/maps?f=q&hl=en&sll=-43.221299,171.928037&sspn=0.002533,0.004967&ie=UTF8&ll=-39.385256,175.399566&spn=0.002687,0.004967&t=h&z=18. New Zealanders customarily disparage their railways, which were built with difficulty and have been managed half-heartedly over the years. It’s as if the nation can’t decide whether rail is essential or superfluous to the task of transportation across the two mountainous land-masses. The North Island Main Trunk Railway has been improved over the years by building deviations before and after the Second World War, and by a piecemeal electrification. The Wellington-Paekakariki section was electrified at 1,500V DC in 1940, and 255 miles between Palmerston North and Hamilton were electrified to 25 kV 50 Hz AC in the 1980s. This means that the Overlander leaves Auckland behind a diesel locomotive, changes to electric power at Hamilton and back to diesel haulage at Palmerston North, running under electric wires it does not use from Waikanae through the Wellington suburbs to its terminus: http://en.wikipedia.org/wiki/File:Northisland_NZ_NIMT.png. In 2006 there was a strong likelihood that the Overlander, the only remaining train between the North Island’s two biggest cities, would close completely: the service was reprieved three days before the closing date, and both the line and the rolling-stock were refurbished. As a result, passenger numbers rose significantly, and the length of the trains and the number of days’ service have repeatedly increased. 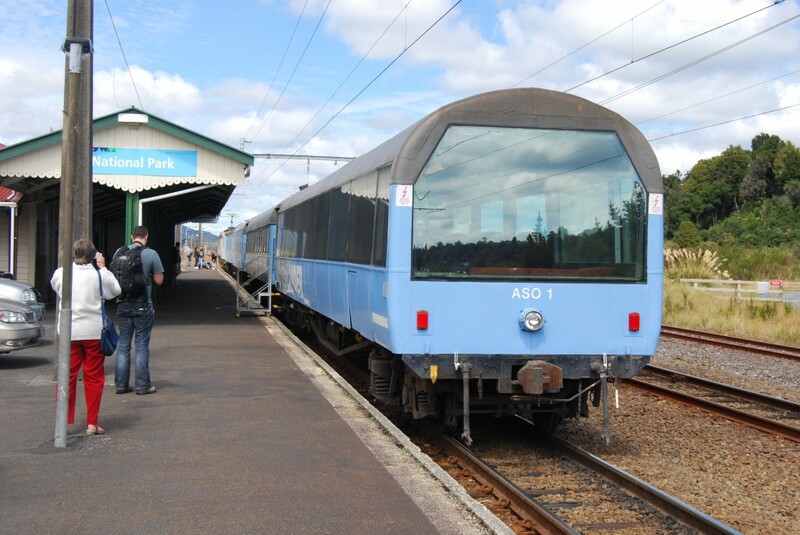 Update: In June 2012 the Overlander was rebranded, speeded up but reduced in frequency as the Northern Explorer: http://www.stuff.co.nz/manawatu-standard/news/7164511/Dash-to-catch-the-last-train. The route and the scenery are just the same but the rolling stock is improved. An excellent description and a practical guide to booking trips on the Northern Explorer is at http://www.seat61.com/Overlander.htm. This entry was posted in Exploring New Zealand, Life-enhancing experiences, Transports of Delight on January 2, 2014 by Mike Higginbottom.